On November 15, 2014, His Holiness Patriarch Mor Ignatius Aphrem II participated in the ordination of Deacon Habib Mrad as a priest in the Syriac Catholic Church. The ordination took place in the Lady of Annunciation Cathedral in Al-Mathaf – Beirut, Lebanon. 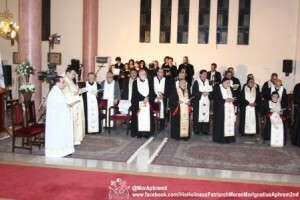 Their Eminences Archbishops: Mor Theophilus George Saliba, Archbishop of Mount Lebanon and Tripoli, Mor Justinus Boulos Safar, Patriarchal Vicar of Zahleh and Bekaa, Mor Dionysius Jean Kawak, Patriarchal Assistant, and Mor Timotheos Matta Al-Khoury, Patriarchal Secretary, attended along with monks and clergy from our Syriac Orthodox Church. The Divine Liturgy was presided over by His Beatitude Mor Ignatius Youssef III Younan, Syriac Catholic Patriarch of Antioch, assisted by some archbishops from the Syriac Catholic Church. 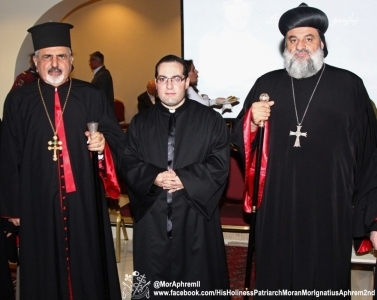 In his sermon, Patriarch Younan welcomed His Holiness Patriarch Mor Ignatius Aphrem II saying that his presence and the presence of the archbishops of the Syriac Orthodox Church made this ordination a special event that reflects the special relation that connects the two Syriac Churches. The new priest, Fr. Habib Mrad, chose the Biblical verse “The Lord is my portion” as his motto for priesthood. He expressed his deep joy and thanked His Holiness and the accompanying delegation for honoring him with their presence and participation.